Try This Restaurant Recipe At Home! 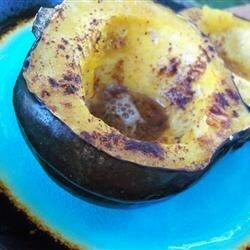 Baked Acorn Squash: Fall and Winter are perfect seasons for serving this favorite vegetable recipe. It's time for the comforts of fall, like home-made soups and acorn squash. Squash is a classic harvest side dish but with this restaurant recipe and, even though many of my restaurant guests are meat lovers, most of them can actually make a meal out of this baked squash recipe. For that matter, so can my husband! 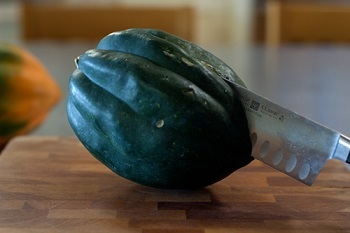 Squash can be roasted, baked or puréed. 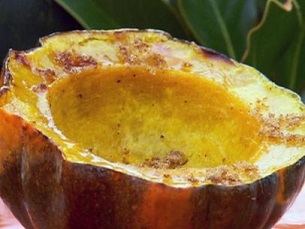 Cook a squash, remove the flesh, mash it and serve it that way or make a soup, muffins, breads or even desserts. This squash is a winter squash that looks a bit like an acorn. The most common variety is dark green with a deep ridged outer skin and a deep yellow to orange flesh and is often about 6 inches long. Less common, but available in some areas, are the white and gold varieties. 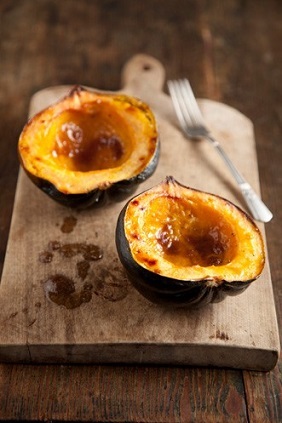 Squash really is delicious when baked with brown sugar (or honey) and butter. It has a sweet, nutty flavor that everyone seems to love. Small individual squash can be served whole and when I have these on hand, I usually stuff them with sausage and other meats or other vegetables with seasonings and then bake them. This squash recipe assumes the larger size that you must cut into portions. Make sure you use a sharp knife when you do so and please be very careful. This squash recipe is easy and quick, but you will be rewarded with great flavor and smiles from everyone you cook for. Add butter and serve. You and your guests may want to add your own salt and pepper to suit your individual tastes and/or diets. (Go easy on the salt). TA-DA! You're finished. Time to enjoy! Did you know? Squashes are one of the oldest known crops - 10,000 years by some estimates from sites in Mexico.